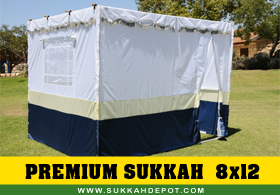 The 10×16 premium sukkah is the flagship item of the EZ-Lock line 8 f High and has3 tone color combination with decorative tassels along the top, and a super size window. SKU: SDPK1016n. Category: Premium Sukkah.